Once a thriving wee fishing village, Auchmithie is now a quiet residential settlement whose harbour is slowly decaying and crumbling into the sea. The village is perched on a cliff top with views out over the North Sea. About 150 feet below is the pebble beach and the remains of the harbour built in 1891. A few fishing boats are dotted here and there and a sprinkling of sea fishermen get their rods out on the beach (quiet at the back, there!) when the weather and tide are right. But most of the time it's a sleepy backwater visited now and again by beachcombers and dog walkers. It's also supposed to be a rich source of agates although I've yet to see anything out of the ordinary. Even when the fishing was at its peak, life was very, very hard for the inhabitants. In the early 1800s, the village had a population of 400 and the harbour was home to 12 white fish boats, 6 large herring boats and around 20 small boats fishing for lobsters and crabs. It's also the place where the world famous Arbroath Smokie (smoked haddock) was first produced. 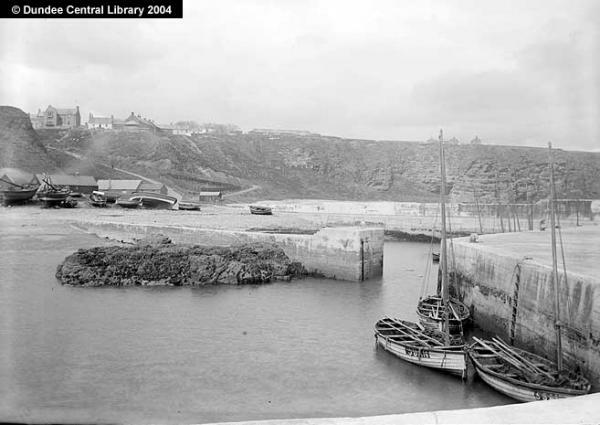 The right hand wall of the harbour in this old pic has crumbled away to nothing and the other half is going the same way. In the background, you can see, behind the fishing boats and huts, the steps leading up to the village that are the subject of my photograph. 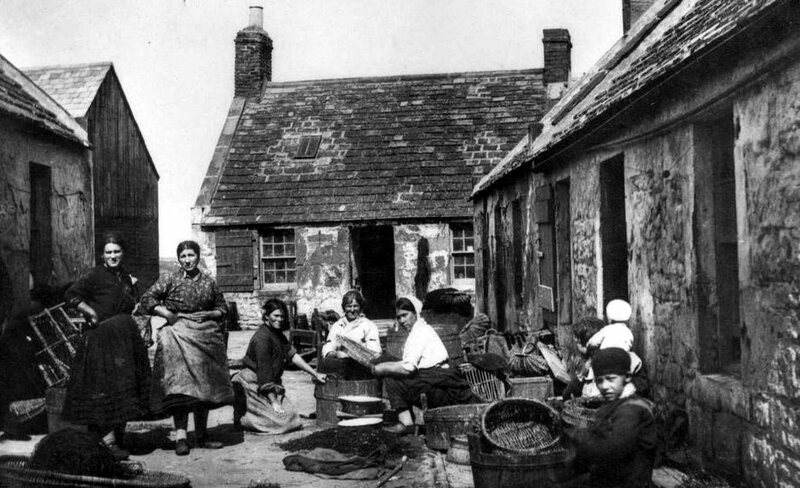 In the 19th century, the local Arbroath Town Council tried to develop its own fishing industry by improving the town's harbour facilities and making land available for housing for skilled fishermen who wanted to move there. 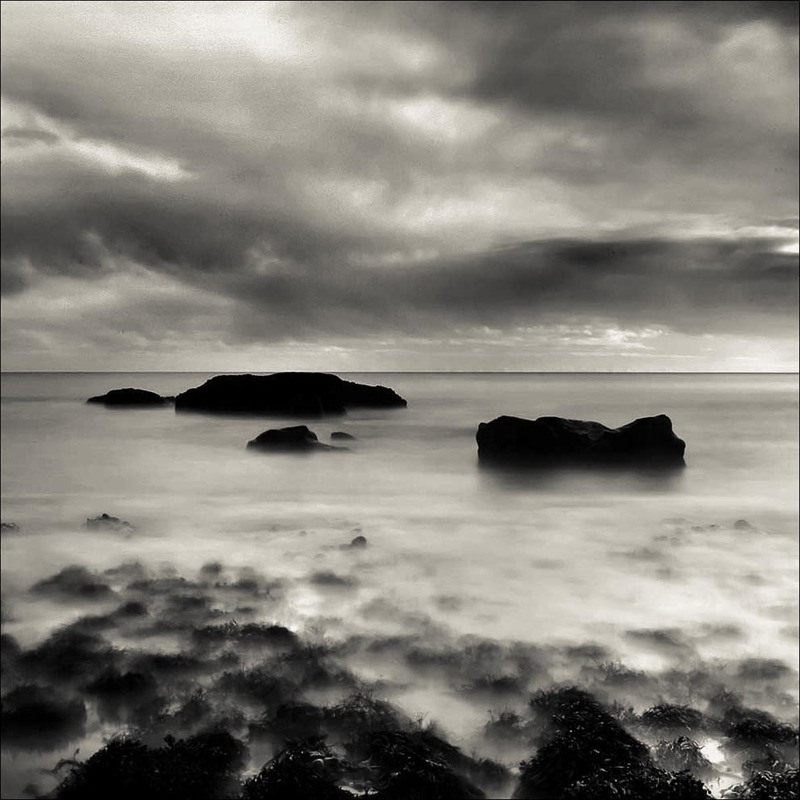 The effect on nearby Auchmithie was fairly drastic. 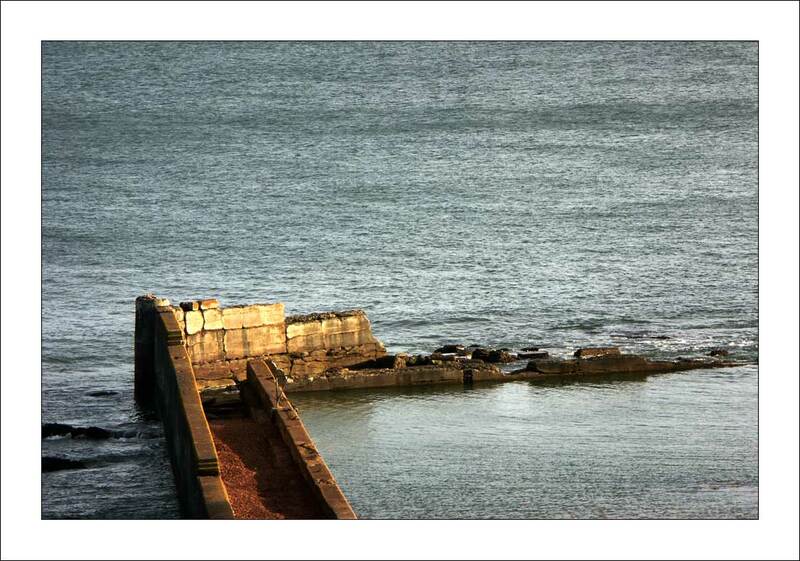 Many of the Auchmithie people moved the few miles down the coast to Arbroath and the village harbour was abandoned to all intents and purposes. I hadn't been to Auchmithie for ages so I had a run along during a spare hour last week to see if I could find anything new to photograph. I love the place but it's one of those locations that promises much photographically but never quite manages to deliver. There are some nice views but the only dramatic photographs I tend to see involve the wooden steps that lead from the beach up to the houses atop the cliff. Or the other way round depending on where you're standing. Regardless of whether I manage to get a worthwhile photo or not, just being out in the elements with a camera and the promise of a nice image is enough to make my day. or five years ago. I might have another go at long exposure photography but with film. In Auchmithie's heyday, the women of the village used to meet the fishermen on the beach and load the catch into baskets which they then hoisted onto a shoulder and carried the 75 yards up the very steep hill. 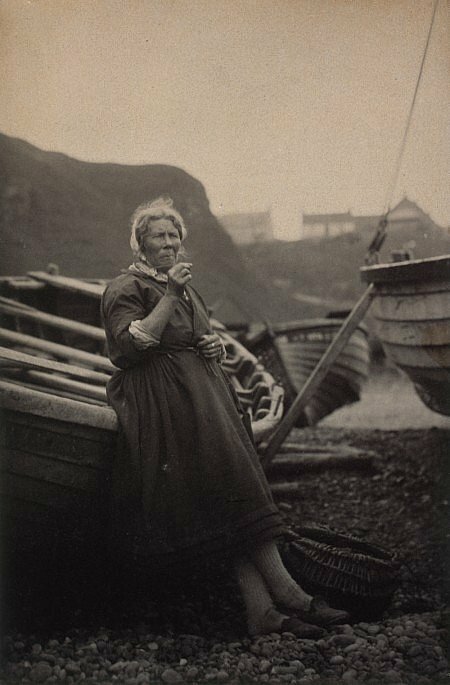 I was knackered walking up the slope with just a camera bag but we're all soft nowadays compared to the near super-human capabilities of hard-as-nails, 19th century fisher folk eeking out a subsistence living. The steps have been replaced no doubt many times over the years but they still carry a significance for me. I sometimes imagine what it must have been like for the women wearing heavy shawls and battling gravity and fierce North Sea storms as they made their way up the cliff. For all those Sir Walter Scott fans out there, the village was the author's inspiration for Musselcrag in his novel, The Antiquary. 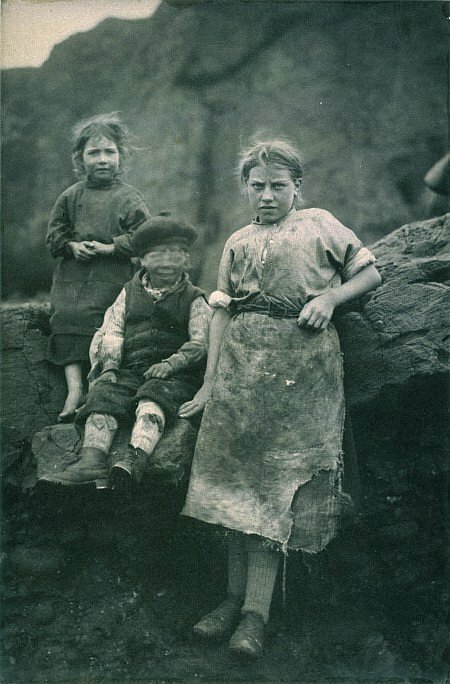 Below are a couple of platinum prints of the locals by James Cox taken in the 1880s and in the collection of National Galleries Scotland. The young lad in the first one must have moved his head during the exposure. Anyway, enough of the local history lesson. Back to the photography! The photograph at the top of the page was taken just after a light storm had passed, giving me a bit of a soaking in the process. I set my old Slik tripod up at the bottom of the steps but the rain came on before I could get my camera out. I had a Contax 137 MA with me along with the 28mm f2.8 Distagon, 50mm f1.4 Planar and Yashica 100mm f3.5 macro - my standard Contax outfit. A roll of Silvermax was in the camera rated at 50 ISO for development in Spur Acurol-N.
Photographing the steps? It's got to be wide angle shot, hasn't it? 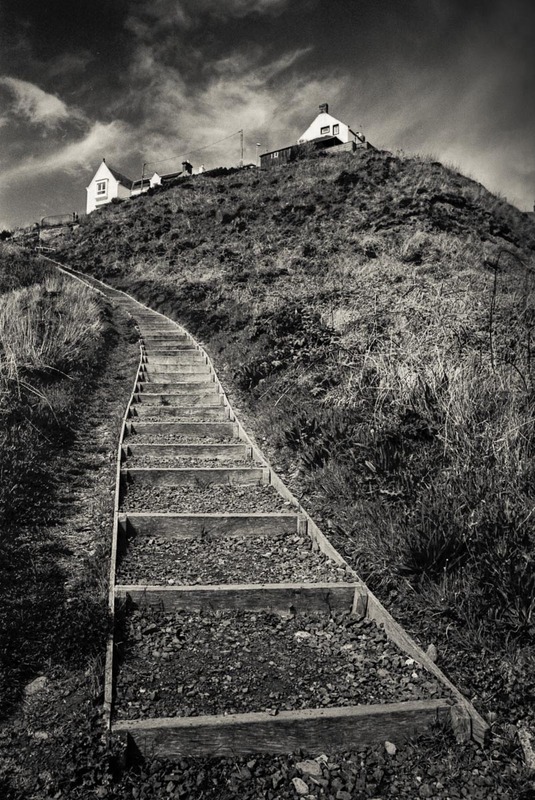 I wanted the steps large in the foreground tapering away up to the white houses at the top of the cliff. A shot with the 100mm from much further back might give a more realistic impression of the severity of the slope but I didn't think of that at the time. Maybe it'll keep for a return journey. This is all that's left of the old harbour. The weather was very changeable and seemed immune to my exhortations. 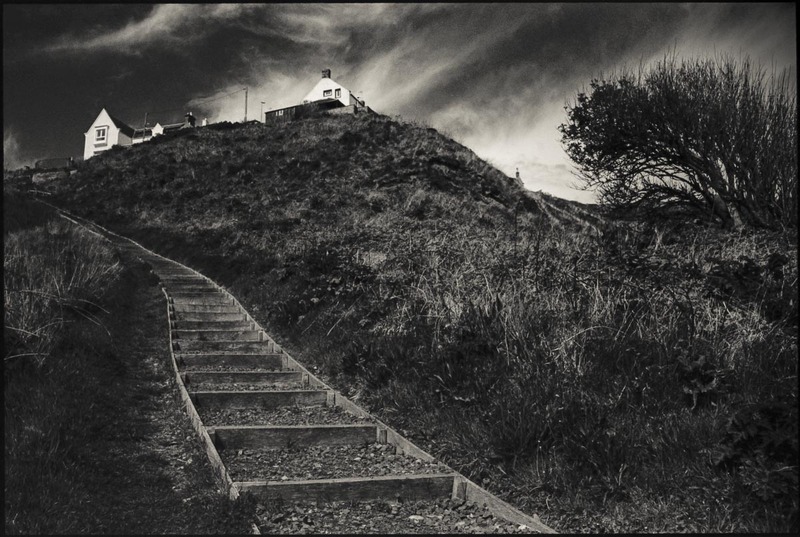 I had a red filter on the Distagon and wanted to get some blue sky behind the white gable ends of the houses so that they would stand out stark and clear and provide a natural resting place for the eye once it had travelled up the steps. The red filter would also darken the green bushes either side of the steps which would act almost like edge burning in concentrating the attention on the steps and houses. But would the clouds sort themselves out into an obliging formation? Would they hell! I must have waited for about half-an-hour and eventually gave up the notion of getting the perfect composition and just settled for what was there. When one house was against the blue sky, the other had some clouds at the rear and vice-versa but, not being a climate change scientist, there was little I could do about it. The photographs I've posted here were the best from about ten tries, not helped by the fact that I was using the self timer to trip the shutter and what was sometimes a nice cloud formation at the start of the timing process was often something else ten seconds later. I really like this shot and might have picked the tripod up at this point but then thought I should have a look at a horizontal framing. The vertical composition does a better job of emphasising the steepness but the thing I liked in the landscape format photograph was the large bush to the right. Had the sky behind it been dark then it would have blended in and been largely unnoticeable making its inclusion in the composition pointless. But when I looked through the 137 MA's viewfinder I could see the branches sharply defined against a patch of white cloud. I had to move quickly as the clouds were changing all the time and a few minutes later the bush was lost against the sky. I think the horizontal shot works well. The eye still follows the steps to the left hand house and then moves over to the house on the right before being lured further rightwards by the bright patch of sky and back down to the steps. I'm not sure which version I prefer. Maybe the telephoto shot - might have to take it at low tide to get far enough back - will turn out to be the pick of the bunch. How is the Contax 137MA holding up then Bruce? I see a lot of them on Ebay that seem to be 'for spares'. My preference is for your vertical image. Nice photos! Horizontal for me Bruce - outstanding photograph! Its the vertical shot for me. Horizontal for me too, Bruce: it has drama. The vertical photograph is more of an illustration. The upright picture has everything going for it in terms of composition and being pleasing on the eye, it’s a picture that you would find on a postcard or calendar.... I hope that comes across as a compliment Bruce, which it is! But for me the landscape picture has so much more going on. The tree really gives the image a sense of place... it makes me want to visit for myself rather than just thinking that’s a nice photo. That’s the great thing about monochrome landscape photography... being able to interpret the scene in your own personal way. Enjoyed the old photos in this post too. The Contax is doing fine but being an electronic camera it wont last forever, I suppose. Just as well I have a few other bodies in reserve! It's the only way to work with battery dependent cameras, especially when they're so cheap. Looks like it's 4-2 in favour of the horizontal shot so far. Horizontal for me. Very nice image. Enjoy your blog.